The Romans used weird, weird math. To multiply two terms, they repeatedly doubled one of them in one column while halving the other term in another column, throwing away any remainders that came up, crossed off half the numbers in the first column, added up what remained, and — voila! — got the right answer. How on earth did they come up with it? And why on earth does it work? Here’s what it looks like. If you’re not a mathy person, don’t worry, I’m not asking you to do any calculations–just to enjoy the strangeness. 3. If a number in the second column is even, cross it off in the first column. 4. Add up all the remaining numbers in the first column. 5. And here’s the answer! That’s all I have. If you want to know why it works, one of these links should satisfy. Or, if this is too much math for you, just be glad I didn’t tell you about multiplying infinity. Are our schools teaching arithmetic? My dad the mathematician taught me something important about math. Mathematics has two aspects that go hand in hand: arithmetic and concepts. Arithmetic is basic addition, subtraction, multiplication, and division. It’s hard to learn the concepts if you don’t have a good grasp of arithmetic, and it’s boring to learn arithmetic without the concepts. Math can be fun. I’m serious here! How come so many people hate it? How come so many women feel like they’re no good at math? There are a lot of reasons, but let’s start with ground zero. Arithmetic. How many people have their math facts memorized? I assumed everybody who gets to adulthood has their math facts memorized, and I assumed it was being taught in schools. Now I’m not so sure. Here in Seattle there are a lot of the parents I know are paying for math tutoring, particularly for arithmetic practice. Check out this map of Kumon tutoring centers. 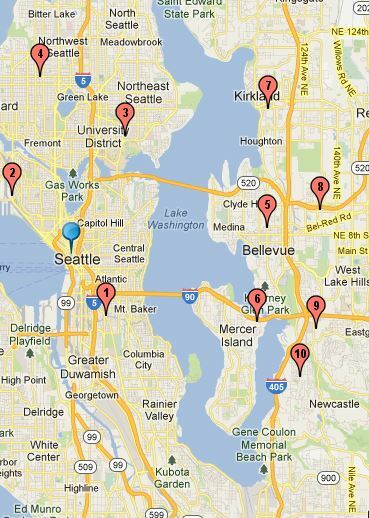 There are ten centers within nine miles of downtown Seattle. People are paying for something that really should be the job of schools. However, it’s hard for teachers to “squeeze it in.” How could that possibly be? Is it because high-stakes standardized testing has squeezed it out? Now take another look at that map, bearing in mind that northeast Seattle, Bellevue, and Redmond are the most affluent and whitest parts of this area. Where are these tutoring centers concentrated, and where are they completely absent? There are none in southeast Seattle. Guess it’s not so profitable there. This is the “opportunity gap” in action. In addition to paying for tutoring, many Seattle parents are practicing math facts at home. This would be fine if kids were also getting it at school. But if they’re not getting sufficient math fact practice at school, then parents who are practicing math facts at home and paying for tutoring are masking a significant deficit in our children’s education. This is the opportunity gap in action. So I’ve been asking around. Math fact practice is not necessarily a daily event in the classroom. If kids haven’t mastered arithmetic and subtraction by the end of grade 2, they’re not necessarily going to get any more practice, but they will be expected to start learning multiplication, division, and fractions. If they are significantly below standard, they will be eligible for some kind of pullout service, where they get math help but miss the regular curriculum other kids are getting. Plus, the stigma of “not being good at math.” So they fall farther behind. Now, there’s a lot of talk of “accountability.” High-stakes standardized testing is supposed to hold teachers and schools accountable, isn’t it? Well, it doesn’t work. It punishes teachers if they spend too much time teaching what’s not on the test. And I don’t think that basic math facts are on the test. Through elementary school, there are two tests Seattle kids get. One is the Measures of Academic Progress (MAP), and it’s district mandated. The other is the Measures of Student Progress (MSP), and it’s state-mandated. The MAP test is untimed, which means that if kids are counting out their math facts on their fingers, that’s fine. As for the MSP, I’ve looked at a practice test and it hasn’t got much in the way of math facts. It focuses on math concepts and generally uses easy arithmetic. And yet enormous amounts of time and money are spent on these tests. Schools have to give up their libraries for weeks in order for these tests to be given. Schools are rated based on these tests, and the trend is for teacher evaluations to be based at least partly on the results of these tests. If parents want math facts to be taught in schools on a daily basis, then we kind of have to stand in line, behind the demands of these tests. What’s the answer? To me it’s blindingly obvious. Do these three things. Take five or ten minutes out of every school day to drill on math facts. But some kids are farther along than others, right? Won’t the kids who already know addition and subtraction be bored? Actually, I think it’s okay for kids to be bored for five or ten minutes a day. Take some of the pressure off the teachers. Cut down on the amount of concept material that is required to be taught and eliminate the high-stakes component of standardized tests. If you’ve got to have insanely expensive standardized tests, at least take part of that test time and use it to measure math fact mastery. Of course, everybody and their dog looks at schools and thinks they see a massive problem that is blindingly obvious to them. Most people are wrong. Am I wrong? Am I missing something? All I know is I’m out of time for today. I’ve got to go drill my son on math facts.